News and notes from the site of WrestleMania Week, Rey Mysterio will wrestle at 'Mania, Legacy Wing inductees for HOF, talent set to return soon, MSG show tonight & more. **First off, I hope everyone is enjoying the WrestleMania Road Diaries that Wai Ting and I have been doing. I apologize for the lack of news updates as I knew it would be difficult with so much going on and running around the city. One thing that has been an eyeopener for me this weekend is how this site has grown and that it goes well beyond what it did one year ago. It’s given Wai and I a lot to think about in terms of adding resources. **If you are a member of the POST Wrestling Café, we have the WrestleMania Road Diary Day 1 and Day 2 podcasts up. In addition to our road stories and news updates, we have reviews of Bloodsport, MLW’s television taping on Thursday, Wrestlecon’s U.S. vs. The World, Rev Pro, and NXT TakeOver. We will have another show up late tonight with a full review of the ROH and NJPW G1 Supercard. Wai Ting is also doing lens updates for Patrons involving something that makes me looks like a dog. **Braden Herrington and Davie Portman attended NXT TakeOver: New York and have a POST Show with a big breakdown of the event. They were also joined by Scrump and Jesse from the 6 for their live thoughts on one of the major cards of the weekend. **A reminder that our POST Wrestling LIVE in New York show is Sunday at Noon at the Broadway Comedy Club at 318 W. 53rd Street, which is a five-minute walk from the Hilton Midtown where Wrestlecon is. Your ticket includes a meet-and-greet at 11 am or 1:30 pm with the Q&A going from Noon-1:30. I’ve run into so many listeners this week and cannot thank you enough for the support and listening to us. Please don’t hesitate to pop by and say hello, even if I have my headphones on. **The WWE’s Hall of Fame ceremony takes place at 7 pm Eastern tonight on the WWE Network hosted by Renee Young and Corey Graves. There will also be a red-carpet ceremony at 6 pm hosted by Maria Menounos. The inductees will feature DX (Triple H, Shawn Michaels, Billy Gunn, X-Pac, and Chyna), Bret Hart and Jim Neidhart, Torrie Wilson, Harlem Heat, Honky Tonk Man (to be inducted by Jimmy Hart), Brutus Beefcake (to be inducted by Hulk Hogan), and Sue Aitchison will receive the Warrior Award. **Dave Meltzer reported on the Wrestling Observer website that Rey Mysterio will compete at WrestleMania against Samoa Joe. Mysterio suffered an ankle injury during his match with Baron Corbin this past Monday and was pulled from his match with Andrade on SmackDown. **Despite a bad landing near the end of the NXT tag title match at TakeOver, Ricochet was said to be fine afterward. **Mike Johnson at PWinsider.com was the first to report the list of this year’s Legacy Wing inductees into the WWE Hall of Fame with the following names: Bruiser Brody, Wahoo McDaniel, Jim Barnett, Hisashi Shinma, Luna Vachon, Special Delivery Jones, Buddy Rose, Professor Toru Tanaka, and Joseph Cohen who launched the MSG Network. **Paul Levesque stated during the post-show media press conference that Friday’s TakeOver card was the most-attended and highest-grossing event in the brand’s history. **The WWE is scheduled to start running vignettes for Bray Wyatt imminently. I was told there are big changes to the character that have been in the works for a while. **Sami Zayn is also scheduled to return imminently. I wasn’t told specifically or if it’s even been decided on, but I’d be shocked if he wasn’t back on television by the end of the Montreal tapings next week. **The WWE has timed out WrestleMania and they do have a target time for the show to end, however, it was conveyed to me that there is no way that all the times will be followed and suffice to say, it’s going to be a really late night on Sunday. **I got to walk around the Wrestlecon convention on Saturday and there are countless names in attendance. Throughout the day, the most consistently long lines on the 2nd floor were those for Rob Van Dam and Enzo. **New Japan Pro Wrestling was very happy with Colt Cabana’s performance on the recent tour and he appears to have an open invite to do commentary on the English broadcast side. Cabana got over as the sentimental underdog in the New Japan Cup and became one of the stories of the tournament. 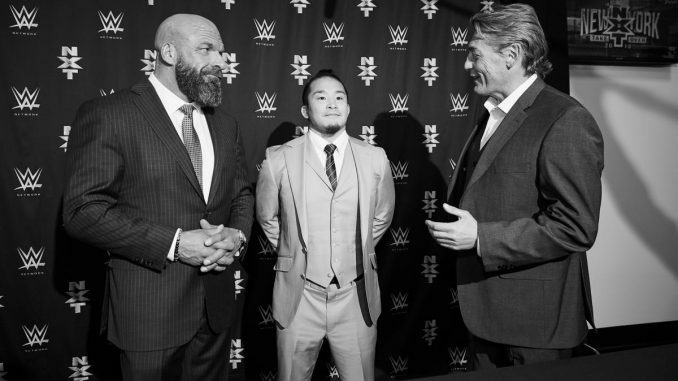 **KUSHIDA made his first on-screen appearance for the WWE at Friday’s TakeOver event at the Barclays Center. Earlier in the day, a video was put up of KUSHIDA signing. NXT is a much better starting point for him than 205 Live or one of the main roster brands. **There was a funny story on Saturday with Kevin Owens getting from the wrestler’s hotel in Brooklyn to his signing at Axxess. The driver that was assigned to Owens accidentally took him to MetLife Stadium causing Owens to be late. **The WWE has hired Josiah Williams, who has created numerous remixes of themes under the Wrestle & Flow banner. He will be based out of the Performance Centre and working with the WWEPC’s Instagram content this weekend. WWE’s announcement stated he would be an on-air digital talent for the company.